Somehow, and not by design, we have ended up with scaffolding on both houses simultaneously. I know maintenance has to be carried out, but this is not an experience I’m enjoying in the slightest. 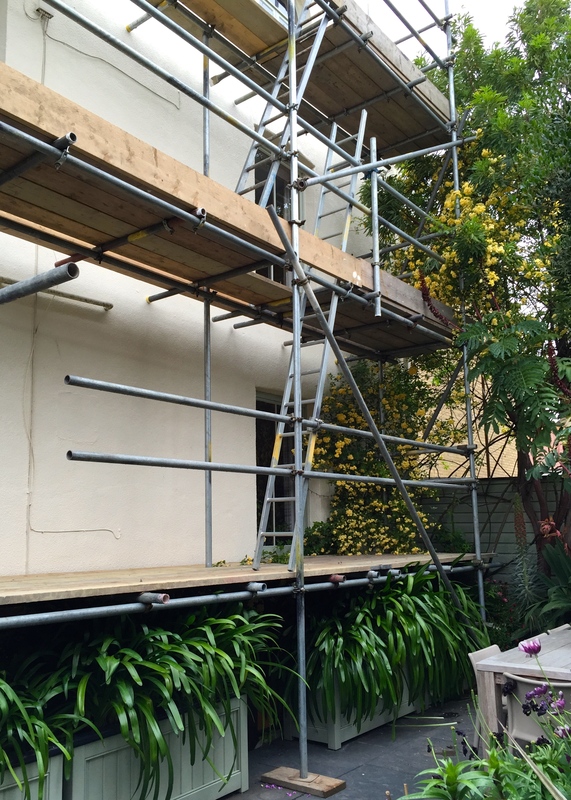 Scaffolding is the architectural equivalent of Hannibal Lecter’s mask: ugly, sinister and restricting ….. but ultimately necessary. 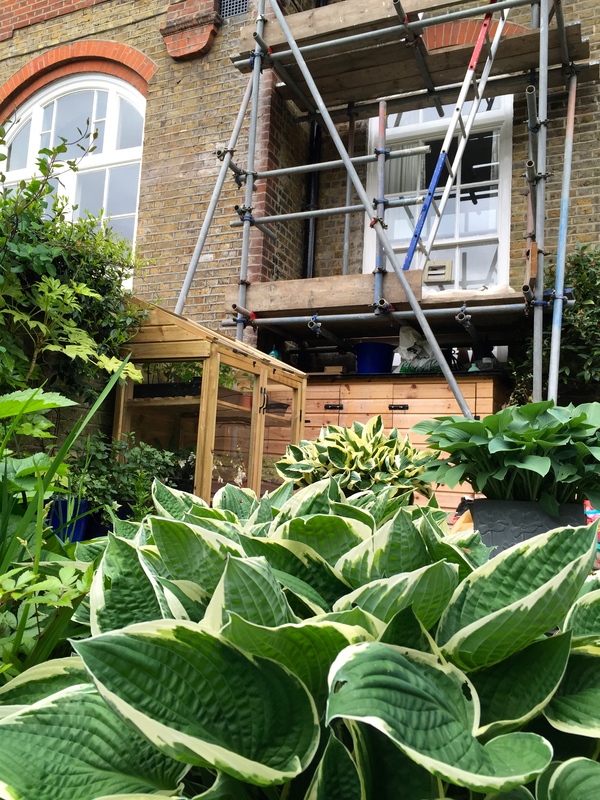 In small gardens like ours building work makes a confined space even trickier to work in, and inevitably plants get squashed, mashed or showered with all manner of unpleasant detritus. 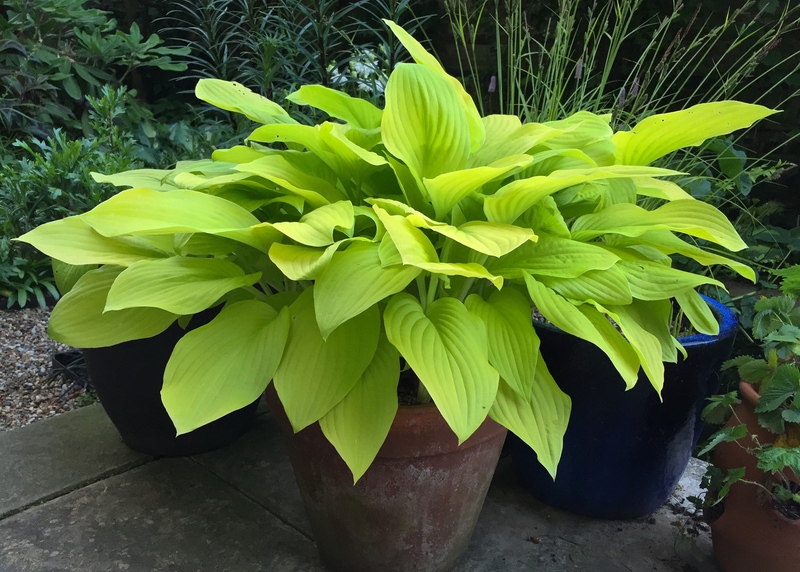 Try spattering your prize hostas with wet, caustic mortar and you’ll understand my distress. It’s unlike Him Indoors to see the bright side, but he was rather relishing the high-level sunbathing opportunities created by the aerial platforms. That was until he cracked his head on a scaffolding pole when trying to extricate his bicycle from the basement and then he changed his mind pretty rapidly. In fairness, the scaffolders have been particularly careful. In both gardens poles have been deftly positioned so as to avoid my most precious plants. Between you and I, I’m quietly impressed. But, what goes up, must shortly come down and I am not counting my chickens. I’ve been here often enough to know that workmen who care about plants (with the exception of landscapers, and even then I’ve had dodgy experiences) are rarer than hen’s teeth, so it pays to lay it on the line in terms of what must not be annihilated. In our coastal garden we had it coming. The Watch House windows haven’t been decorated properly in eight years, which is pushing it, and the roof has so many old seagull nests on it you could forgiven for thinking it’s thatched. From a gardener’s point of view the ideal time for this kind of work would be midwinter, but for some reason decorators like to wait for fairer weather. Tragically this means our Rosa banksiae ‘Lutea’ is pinned mercilessly to the wall by iron bars. By the time she breaks free her fleeting moment of glory will be over and we’ll have to wait until next April for another glimpse of her golden tresses. Shaded by the first ‘lift’ of scaffolding boards, my agapanthus will hopefully recover quickly. 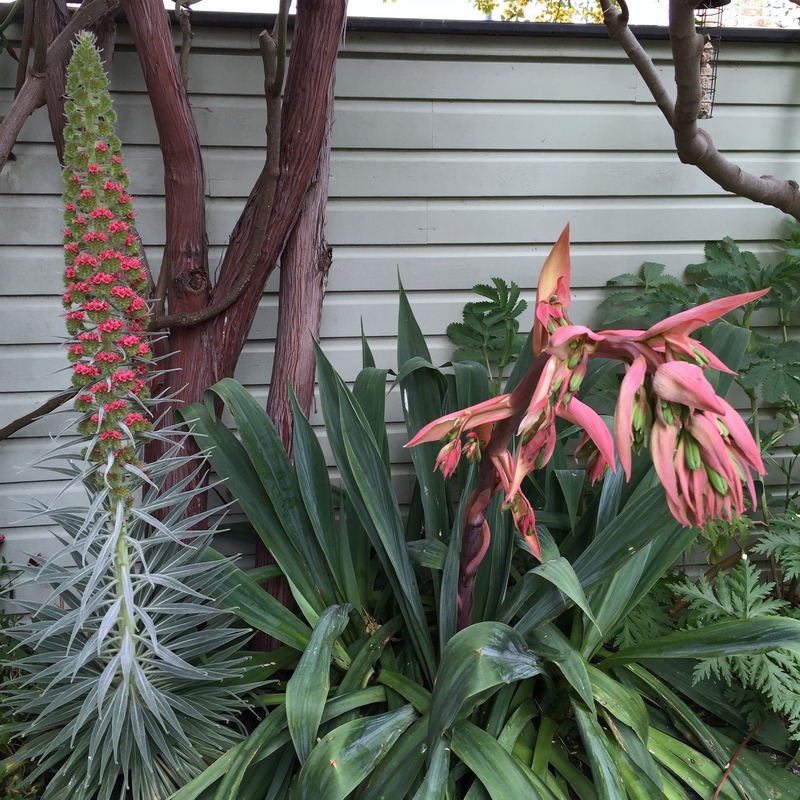 Two vulnerable plants were to be protected on pain of death – Echium wildpretii (above and below left) and Geranium maderense – the former flowering for the first time following 2 nail-biting winters. I am so pleased with my ‘tower of jewels’ and wish I had planned ahead so that I had plants primed to flower next year. The seedlings I’ve raised this spring may not send up flower spikes until 2018 and then of course they will die. I may have to cheat and buy some mature specimens in. Geranium maderense is also monocarpic (i.e. it dies after blooming), but thankfully I have four more of these at different stages so that I have the best chance of getting a display each season. Planting up of pots for summer has been put back by at least three weeks. Back in London the scaffolding has been less disruptive although, given the scale of the job (re-pointing), it’s akin to using a sledgehammer to crack a nut. The structure has created some unhelpful shade and an almighty trip hazard, but will disappear before the urge to grow a clematis up it takes hold. Should I ever feel inclined to develop either garden vertically I will not be short of ideas, although the topmost level will be furnished with steamer chairs and a cocktail bar. Never mind if it’s right outside the neighbours’ kitchen window. I shall be in the same boat shortly, we’re planning on having a chimney rebuilt this year. There’s always something isn’t there? Too true. Old houses seem to need constant attention, and the salty sea air does not do us any favours. Good luck with rebuilding your chimney – all I can say is that you’ll be glad when you have done it. You live in the land of gardeners, and you have problems explaining the importance of not damaging the plants. Just imagine that same exercise here where it seems nearly no one gardens. It looks like you have had very sympathetic, well schooled workers. The excellent word of mouth advertising to other gardeners is worth it’s weight in gold. Perhaps they know this. Good luck with the dismantling, hopefully it goes just as well. Thanks Lisa. The scaffolding in London came down in less than an hour on Friday morning. They were a bit grumpy about having to work in such a tight space, but watching them take it down so slickly was impressive. I guess they do the job for a living so have mastered the art. The other lot comes down tomorrow. Can’t wait! 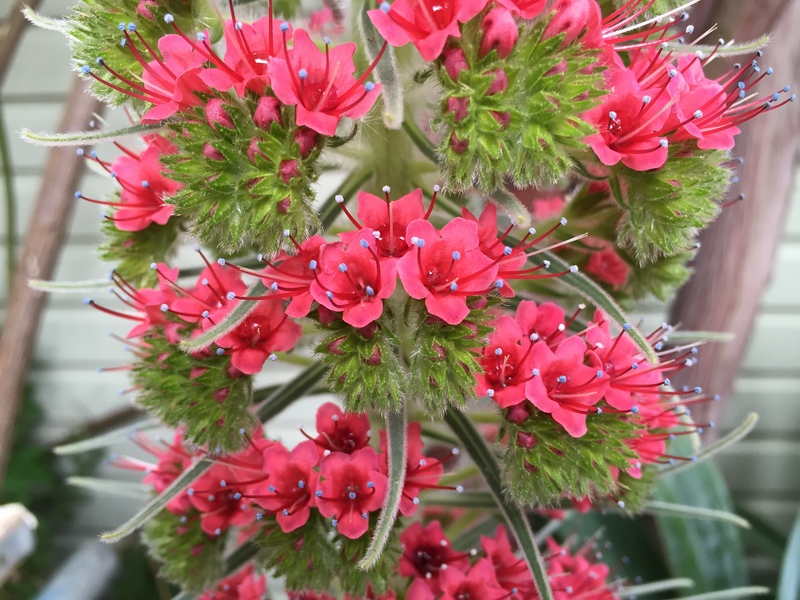 Congratulations on flowering the Echium wildpretii so well. They are a challenge down here in Cornwall [where E.pininana is a self sowing and ineradicable weed]. Is the secret to keep them drier in winter? In London you will have roughly half the rain we get. 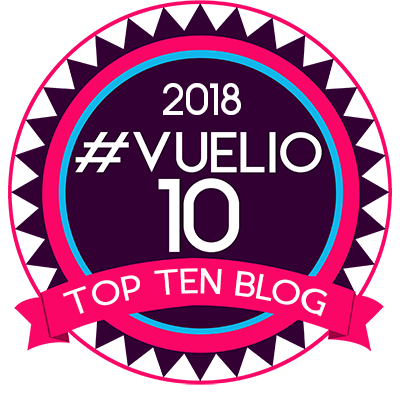 They seem quite happy on the top of Mount Teide where they see much colder winters than we get here. Thanks Chad. I just Googled Mount Teide and some amazing images came up – the Echiums look much more at home in that landscape than they do in Broadstairs! Mine hasn’t started bulking out to create that fabulous cone shape yet – hopefully it will. I believe that keeping them dry is quite important. Mine is planted in a real rain shadow and in dry soil. I didn’t cover it over winter but some people do. I think in Cornwall you might need to – or even take it indoors – as the humidity is much higher in addition to all the rain.